It’s a Bird… It’s a Plane… It’s a Small Plane! Behind what appears to be an abandoned construction site near the intersection of Nguyen Van Linh and Trinh Quang Nghi, with banana trees and marshes in the backdrop, a group of Vietnamese men belonging to the Hoa Hong Radio Control (HHRC) club congregate. 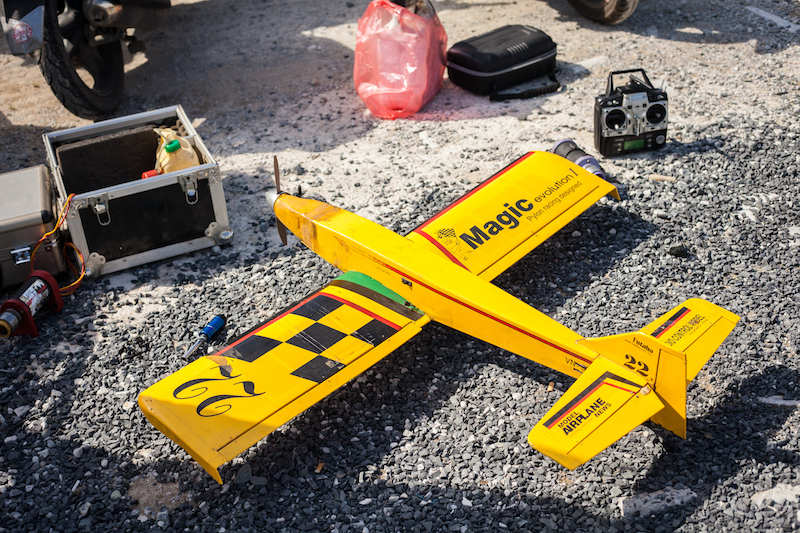 They show up every Sunday, depending on the rain, to fly radio-controlled airplanes from 2pm to 5pm, and then head to a nearby establishment for cold beer and food afterwards. 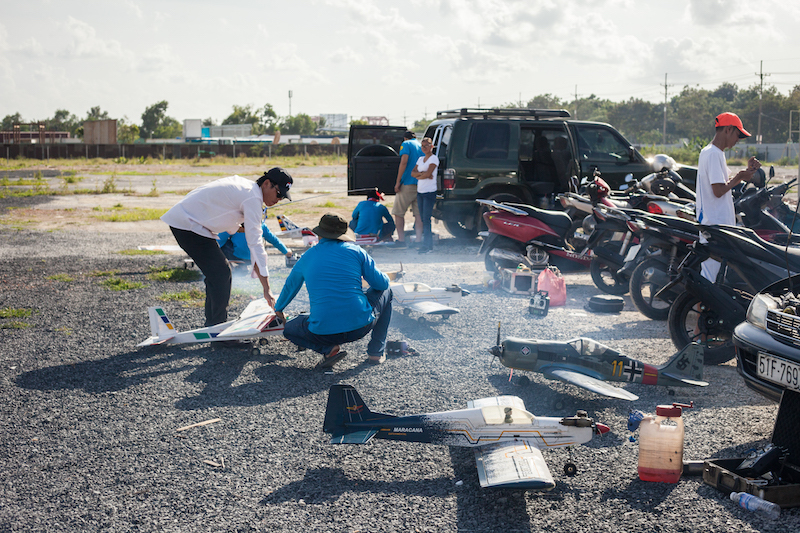 HHRC is the largest radio-controlled airplane enthusiast group in Vietnam, however there are groups in most Vietnamese cities, including HHRC’s sister club on Phu Quoc Island, which has around 10 members. HHRC have been meeting for around a decade, and usually have around 30 active members at any given time. The men, there’s only been one female member thus far, come from many different segments of society, from businessmen driving new SUVs that bring top-notch gear, to laborers driving old, pieced together motorbikes with dinged up secondhand planes. A number of the members are from the local police. 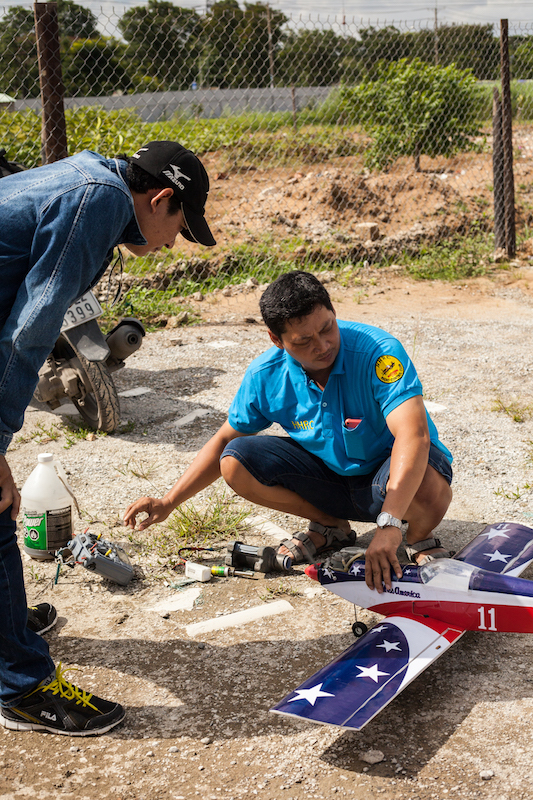 In order to engage this hobby they first had to get special permission from the government, who sent an aviation official to designate their fly zone and to coordinate with officials at Tan Son Nhat Airport. As members gradually arrive, they greet each other, get out their planes and prepare for flight, tuning parts or oiling moving parts then filling the tank with methanol gas. 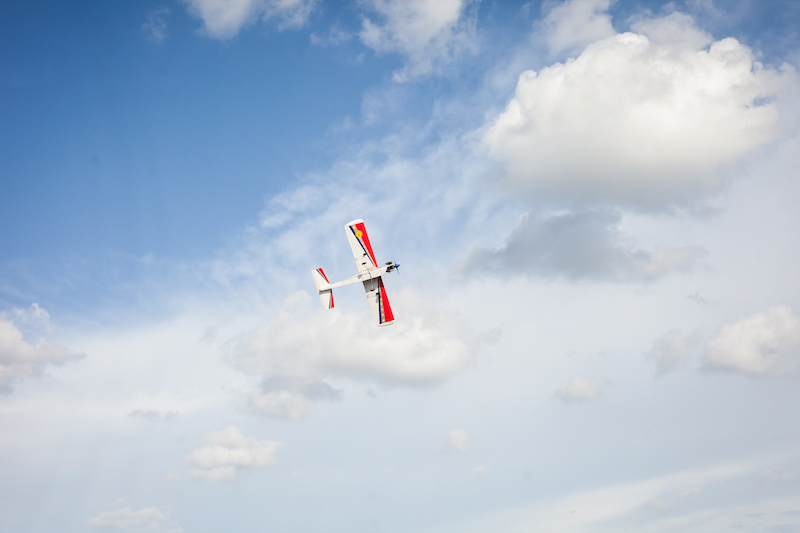 Most plane models are around 1.5 meters in wingspan and 1.2 meters from propeller to tail. 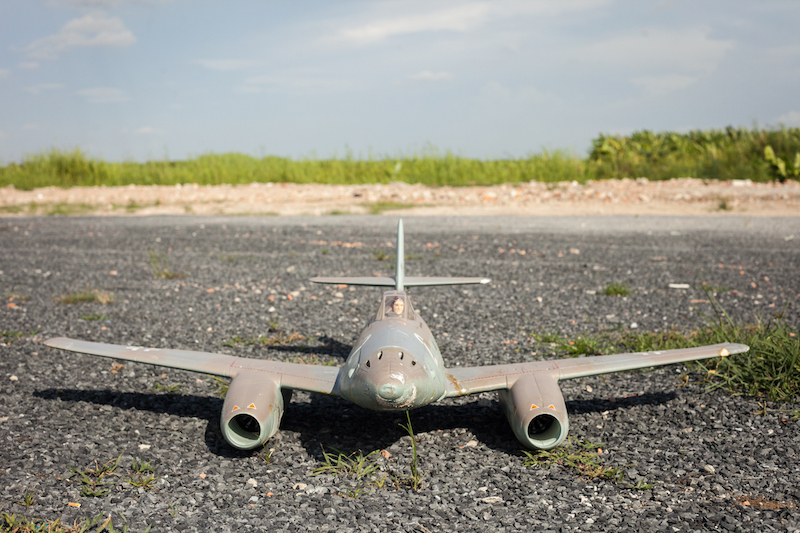 Made of wood and Styrofoam, most are single engine planes, but there are larger models with up to four engines available. 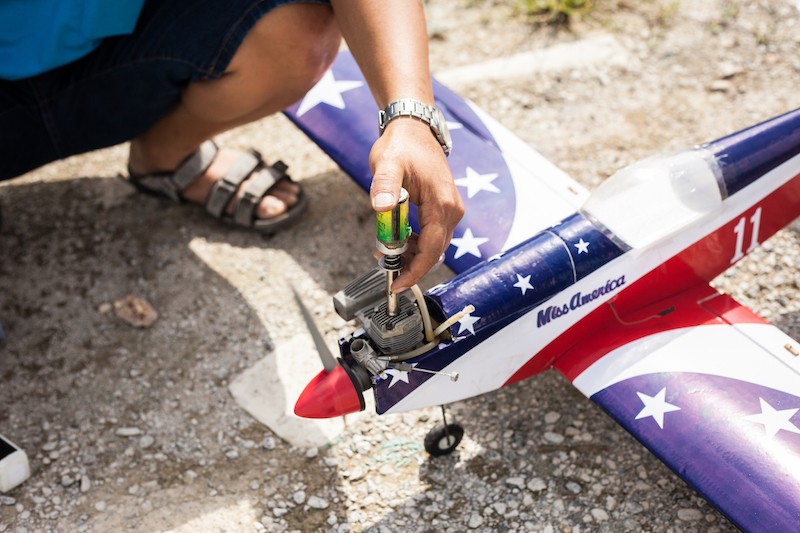 The planes are typically modeled after light aircraft, WWII fighters or modern fighter jets, though some members use small drones, or even model stealth fighters that seem to be a hybrid between a drone and a plane. The typical engines are 7cc, and with a full tank of gas can fly for around 12 minutes before needing to land and refuel. After roughly 15 minutes of set up, including winding the propellers and gassing up the engines, the planes are ready to fly. 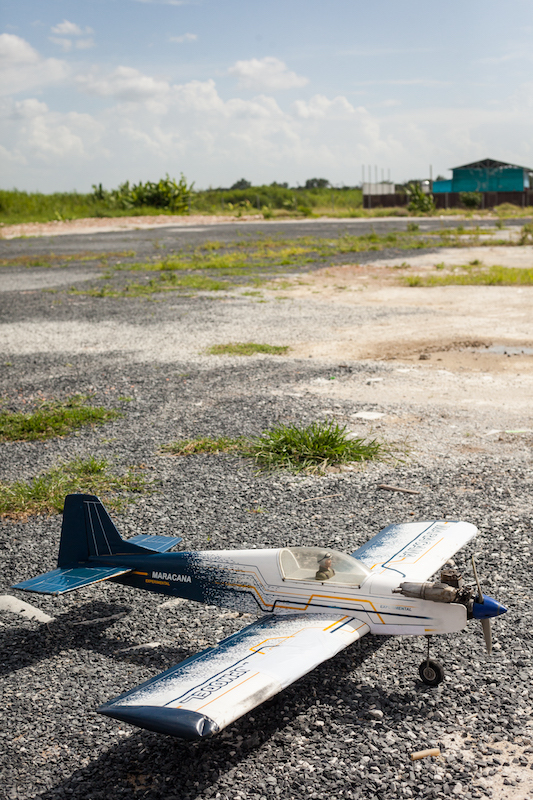 The men move their planes forward with their controllers to a flat stretch of gravel that serves as the runway. When they push the control rocker forward, which dictates the amount of engine thrust, it only takes a few meters speeding forward before the planes go airborne. As the planes zip around the sky they make a high-pitched whine, similar to a gas powered weed eater or a motorbike with a 2-stroke engine. Theoretically, the planes could fly as far as five to seven kilometers away, however the operators typically keep them within a one-kilometer range due to visibility concerns. They can do tricks like you’d see at an air show, though their coordinated flights don’t exactly rival those of the Blue Angels. They can, however, make them corkscrew, loop-de-loop, hover or free fall in amazing, dramatic displays, but according to the operators, these tricks are difficult and take time to master. As the planes fly the men laugh and joke and have a great time, watching one another’s techniques and reviewing each other’s abilities. Among the guys who participate there is a range of skill and experience. There are the older members who are mentors, showing the newer members flight maneuvers and giving them repair tips. There are manuals, but often understanding and technique is passed down. Quick learners can pick it up in a week and start flying, but slower learners usually need at least a month or more to get the hang of it. While they’ve never hit any birds and usually avoid trees or power lines, they do hit each other’s planes at times. 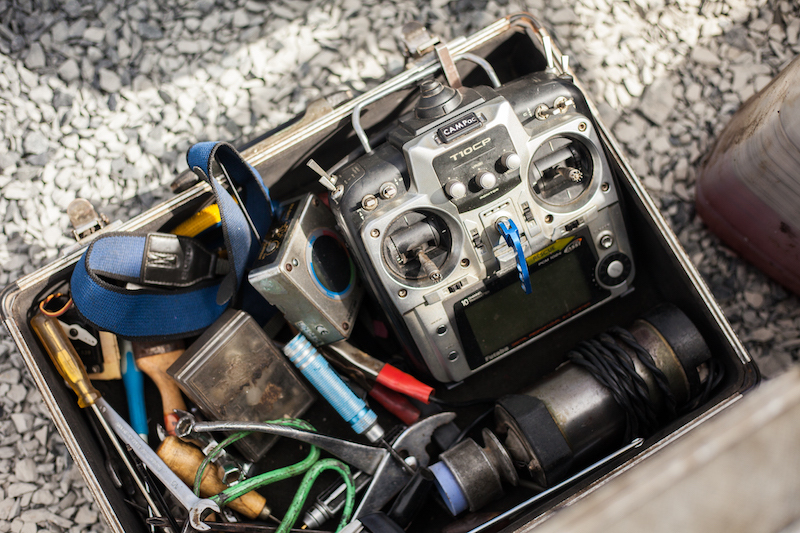 If a plane goes down over one of the marshes or the field of banana trees for whatever reason, they send out a drone with a camera on it to fly overhead and locate the plane, assisting the operator who has to venture out to get it. If they can’t find it this way, the other men will help by fanning out to search for the lost plane. This happens about once a month. To purchase a new plane, the cheapest are around VND3 million, while the higher end models can go up to VND10 million, all imported from Japan. Occasionally members build their own planes or create something experimental, like one gentleman who attached a second propeller. When he tried it, the plane nose went straight down and one of the propellers broke off, which provided the other members with a good laugh.